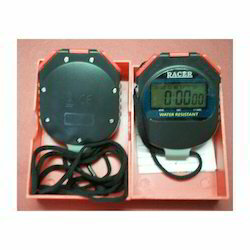 Manufacturer of a wide range of products which include racer stop watch. Press Model Button once, if the stopwatch is on Time Mode, to bring it to Stopwatch mode. Press Start / Stop Button to start the Stopwatch. Press Start/Stop button again to stop the Stopwatch. Press the split/Reset Button to reset the stopwatch to zero. Looking for Stop Watch ?